The world is big in someways and yet so small in others. Today I wanted to share a passenger story with you about a man I’m going to refer to as “Mr. Abdullah”. 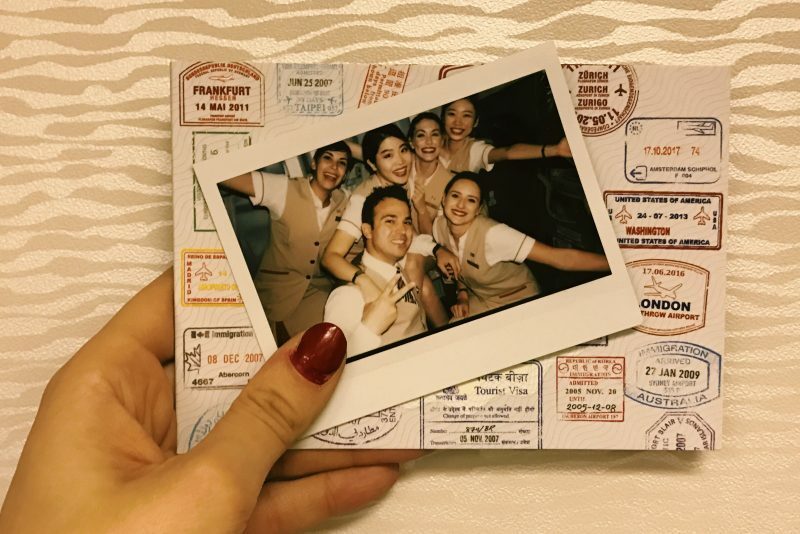 As Emirates Cabin Crew, I get to meet different people everyday that come from all over the globe. Each of us carry different cultures and traditions, and each day I get to learn something new as a result. I’m going to start sharing more of these meaningful experiences with you and hope that you might share your own with me in the comments below! This past April, I got to fly home (to Toronto, Canada) for the first time since joining Emirates in November. It was on this flight where I got to meet two gentlemen; one from Pakistan (“Mr. Abdullah”) and one from India. The Toronto flight consists largely of families and businessmen that are travelling between their home countries and Canada for work or to visit their families. These two men happened to be entrepreneurs who travel with Emirates frequently. Each of them shared with me stories about their loved ones and their businesses back in their home countries. In turn, I spoke to them about my life as Emirates Cabin Crew. I was seated between the two of them, and whenever I got up to go speak to my colleagues I would offer them a drink. At the end of the flight, Mr. Abdullah to turned to me and thanked me for our conversation. I remember him specifically saying “I hope that I get to fly with you on one of your flights. You have a great smile” before he disembarked, and it gave me that warm fuzzy feeling inside. Eight months later, I was preparing refreshing towels and menus for pre-departure in the aft galley of our Emirates Airbus A380 bound for YYZ from DXB. Pre-departure is a very busy time for Cabin Crew because during this time we are assisting customers with their baggage/seating while distributing onboard items (menus, toys etc.) at the same time. We also have to stay alert and listen for direction from our Purser (manager of the flight) over the intercom so we don’t miss any important information. It was during this time when I recognized a gentlemen seated at the back of the cabin. During the flight, I invited him to the galley where we caught up and took pictures together. We were both shocked, yet very happy to see each other again! When we arrived in Toronto, he came to me before he disembarked. Much like he did before, he looked at me, smiled and said “this is why I fly with Emirates. I can’t wait to show my wife these pictures and tell her that you remembered me”. I smiled back and replied “until next time”. I have no doubt that our paths will cross again. Moral of this story? Be kind to others. You never know the impact you could have on someones day and you never know when you’ll see that person again. Next Post Wishing the United Arab Emirates a happy 45th National Day! Wish you all the best for ending 2016! Thanks so much! I’m glad that it motivated you and I appreciate you sharing that with me. Wishing you all the best for the year ahead! You write very well. Enjoyed reading it.